Home › All About God › What Does it Mean that Jesus was “Glorified”? What do you mean by “the process of glorification”? This article is an edited version of the next few questions and answers in that thread. When Jesus said to Thomas (not to Philip, as stated in the original comment thread), “If you know me, you will know my Father also. From now on you do know him and have seen him” (John 14:7, italics added), he was referring, not so much to the crucifixion itself, but to what the he was about to accomplish by means of the crucifixion. 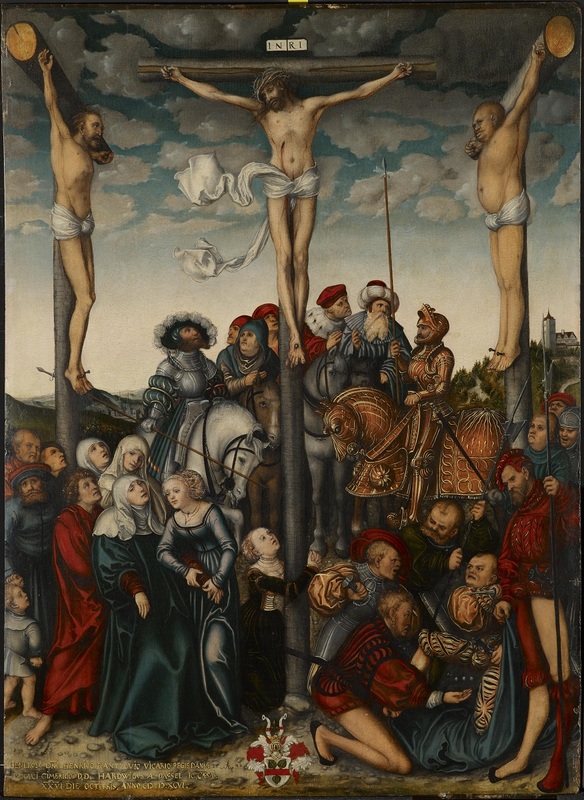 The crucifixion was the Lord’s last and greatest trial or temptation, through which he completed the process of glorifying his humanity, and also the task of defeating the power of the Devil, which is the power of all evil. Glorifying his humanity and defeating the Devil go hand in hand. At the time of the crucifixion the Lord also left behind the last of his finite human substance and heredity from his human mother Mary. Clearly Jesus is not asking the Father to praise him, nor is he talking about praising the Father. “Glorify” here must mean something much greater. The original meaning of “glory” is brightness and resplendence. Jesus is asking for the divine glory, or the brightness and resplendence of divine truth that comes from divine love, to be in him, just has he has shown the glory and resplendence of the Father (the core Divine Being, which is Love) by doing God’s work here on earth. A simple way of saying this is that he is asking to be filled with the glory of the Divine Being. Or in Jesus’ case, to become the Divine Being and its glory. The process of glorification is a process of Jesus’ humanity becoming fully divine and fully one with the Father, which is the divine soul. By completing this process of glorification, Jesus also gained all power—which is divine power—as he says in Matthew 28:18: “All power is given unto me in heaven and in earth.” I am using the King James Version here because the common modern translation, “authority,” fails to capture the full force of what Jesus is saying. With that power, he defeated and continues to defeat the power of evil, the Devil, and hell for all people who are willing to accept that divine power into their lives. Was the consciousness and/or personality of Jesus not divine? Was the “I” in Jesus not the “I” of the Father? At times he seems to distinguish these; at other times they are the same, e.g. “Before Abraham was, I am” (John 8:58). So my question is, in what sense was his incomplete divinity (or whatever you would call it) reflected in his “I,” or “consciousness,” or even personality? During his entire lifetime on earth Jesus went through a continuing series of cycles between these two states of consciousness. Even as a boy, Jesus was aware of his relationship to the Father, meaning his relationship with the Divine Being. And the story says, “Everyone who heard him was amazed at his understanding and his answers.” But then he subjected himself to his human parents once again. So we have one complete cycle of the twelve-year-old Jesus first traveling to Jerusalem with his human parents as their son, then speaking and acting from his divine “I,” then returning to his finite human “I” by going home with his human parents and being obedient to them. In traditional translations of Swedenborg’s writings, the technical terms for these two alternating states of Jesus’ consciousness are “exinanition” (Latin: exinanitio) and “glorification” (Latin: glorificatio). The “pouring out” or “emptying out” that Jesus did was the emptying out of his finite human substance and heredity from Mary. This emptying out created space within himself so that he could be “glorified” by having that finite humanity replaced with an infinite Divine Humanity, step by step, until the process was completed at the time of his crucifixion, resurrection, and ascension. At that time, Jesus’ “I” fully merged with the Divine “I.” There was no longer any separation between the Son and the Father; they had become fully one. The fact that Jesus progressively left behind his finite humanity from Mary until there was none of it left in him does not mean that it was useless. Far from it! Jesus’ finite human heredity was absolutely necessary so that he could face the Devil on the Devil’s own playing field, and conquer the Devil there. The Devil (by which I mean hell seen as a whole; see: “Is there Really a Devil? Why? ?”), cannot endure the direct presence of God any more than any created angel or human being can. If God had directly confronted the Devil, the Devil would have been obliterated. That would have meant the complete destruction and annihilation of every evil spirit in hell. And that is not something that the Lord is willing to do. By temporarily taking on a finite human substance and heredity, God gave the Devil a field of battle on which the Devil could approach God and attack God, and God could engage in battle with the Devil and defeat the Devil’s power without completely annihilating the Devil and all of the human souls (albeit twisted human souls) that form the Devil. Once all of those battles were fought, and the war was won, the Lord had no further need of the finite human heredity from Mary. He therefore left the last of it behind in the sepulcher. That’s why the Catholic Church is wrong in considering the Lord still to be the son of Mary. He was the son of Mary during his lifetime on earth, but he no longer is. And the divine part of him—the part of him that was God—never was the son of Mary. That is why he never recognizes her as his mother in the Gospels. The unbiblical Catholic term “mother of God” has no meaning and no reality behind it. We know from the Gospels that that this alternating process of emptying out the finite humanity and then being filled with the infinite divinity continued right to the end of Jesus’ life. Some of his last words on the cross were, “My God, my God, why have you forsaken me?” (Matthew 27:46; Mark 15:34). This was not, as some biblically illiterate skeptics imagine, a profoundly depressed admission of defeat on Jesus’ part. And it certainly wasn’t Jesus cursing God before he died, as I’ve read in articles by equally ignorant atheists. Rather, Jesus was quoting the first line of Psalm 22, and thereby invoking that entire Psalm—which, in its highest meaning, tells the story of Jesus’ ongoing battle against, and ultimate victory over, the combined power of all evil, which is the Devil. However, he wasn’t just being a dispassionate “Rabbi Jesus,” quoting scripture from the Cross for the edification of his followers. Jesus was 100% genuine and seamless, just like his tunic (John 19:23–25). He never said anything that didn’t reflect the reality of what he knew and experienced. At that moment of supreme trial and temptation, he felt a deep and painful separation from God, who was his own Divine Soul. He was reaching out to the power and comfort of the Psalms to give him help in enduring this last and most painful sense of separation from his own deepest divine self before his final full union with the Father. In reading Psalm 22, we can gain some sense of the terrible struggle in which Jesus was then engaged, and of his victory in that struggle. It was through these struggles of temptation that Jesus put off everything finite from his human mother (“exinanition”), and put on the full divinity of his own divine soul (“glorification”), and thereby became the Divine Humanity. This is what Jesus was talking about when he said, just before he died, “It is finished” (John 19:30). He had now completed his victory over the Devil, and achieved full union with his own Divine Soul of Divine Love, which is called “the Father” in the New Testament. What, exactly, was the “I” of Jesus? Fantastic, very helpful. Ok so then a final clarification. What was then the “status” of the I of Jesus when it was separate from God or experienced as separate? Was that “I” God too? In other words, in what sense does the I that is other than the Father have a real status other than the Father? Was it just experienced as such or was the distinction real and on the way to union, and, if real, was that I of Jesus still God? Consciousness is a tricky, multi-layered thing. A guy walks into a bar (no, this isn’t the setup for a joke!) and some half-drunk schmuck at one of the tables stands up and yells a colorful insult at him. His immediate thought is, “I’m gonna slug him!” He imagines going over to the guy and doing just that. He relishes the pleasure and satisfaction it would give him to sink his fist into that guy’s ugly face. But then he thinks, “Naw, I’m not gonna let that bozo get under my skin.” So he just shrugs his shoulders, walks over to the counter, and orders a beer. It was the same with Jesus during his lifetime on earth, except that although like us he had a finite human “I,” unlike us he also had an infinite divine “I” within it. And though, like the guy in the bar, his lower “I” was a part of him, and was at times the primary “I” of which he was aware, the inner divine “I” always prevailed. “He was tempted in every way just as we are, yet without sin” (Hebrews 4:15). And since, in the end, he always acted from the inner divine “I,” that divine “I” became his entire “I,” and he left the last of his lower “I” behind in the grave. To put it somewhat more technically, during his lifetime on earth Jesus was in a fairly literal way “the Son of God.” God literally fathered him in Mary’s womb. He had a DNA that was, in a sense, a combination of divine and human DNA. (I’m not making a literal, scientific statement here. I don’t know what Jesus’ physical DNA was.) And just as a human son is not only the son of his father, but the son of his mother, Jesus was, during his lifetime, both the Son of God and the son of Mary. God was his father. Mary was his mother. But as I said earlier, unlike us, he never separated from his Father. The Father (God) is divine. The Divine is one, and cannot be divided. So instead of separating from his Father, as human sons and daughters separate from their fathers to become distinctly different individuals, Jesus became more and more one with his divine Father through the process of glorification that I spoke of earlier. Step by step he put off from himself the finite humanity that came from his human mother, and replaced it with an infinite divine humanity that was the expression of his Divine Father. To answer your question more specifically, Jesus’ finite human “I” that came from Mary was not God. God is infinite, not finite. Mary could not pass on a divine heredity because she herself was not divine. What is human cannot give birth to (in the sense of being the origin of) what is divine. What is created cannot create what is uncreated. Mary never was “the mother of God.” Even during his human lifetime, Jesus never recognized Mary as his mother. But he often recognized God as his Father. Also, Catholic doctrine to the contrary notwithstanding, there was no Immaculate Conception of Mary (which is not the same as the Virgin Birth of Jesus). The Bible never says any such thing. Mary had an ordinary sin-prone heredity from her parents just as every other human being does. If that were not so, the Incarnation would have been useless. God had to take on an ordinary sin-prone human heredity precisely so that the Devil could attack him, and he could defeat the Devil on the Devil’s own turf. If the doctrine of the Immaculate Conception were true, it would destroy the whole purpose of the Incarnation. It would render God unable to save humanity. It would take away the field of battle on which the Lord defeated the vast power of evil that held humanity in its thrall, dragging us all down to hell. That’s how utterly false and destructive the doctrine of the Immaculate Conception is. Jesus was tempted in every way just as we are (Hebrews 4:15). That was part of his “I” while on earth. The temptations were real, and the desire to do what was wrong was real. It came from the lower, finite human nature that he got from Mary. But even if he thought and felt those things, even if they were part of his conscious “I,” he never gave in to that lower sin-prone nature, and he never acted on it. He always acted from his inner divine “I,” whether or not he was fully conscious of it at the time. Of course, he became more and more conscious of his divine “I” as his life went on, and acted more and more consciously from it. But just as we sometimes act from our better, inner impulses even when we’re not fully intellectually aware of why we’re doing what we’re doing, so Jesus always acted from the inner divine love rather than from the outer, lesser impulses that came from his finite human heredity. Even though he was at times almost entirely immersed consciously in his outer, finite human “I,” he always acted from his inner divine “I” on anything about which the two were in conflict. Mind you, Mary wasn’t entirely bad, nor was what she passed on to Jesus entirely bad. She had something of God in her too, just as we all do. She was a good, but finite, human being. She was just as subject to error as the rest of us, even if she probably did a little better than many of us. Sometimes there was no conflict between Jesus’ higher and lower self, and the two acted together. But his heredity from Mary was still limited, and he still had to leave all of it behind in order to become fully divine. What he never acted upon was any of the evil, sin-prone parts of his finite human heredity. So although his “I” was to some extent blended during his lifetime on earth, any part of the lower “I” that was in opposition to the higher “I” never became part of his life as he lived it. This is just another way of saying that he was tempted in every way just as we are, yet without sin (Hebrews 4:15). Also, just as in our process of regeneration, or spiritual rebirth, Jesus’ temptations did not get milder over time, but rather got progressively deeper and more difficult, so that the deepest, most painful, and most harrowing one was the last one, which occurred on the Cross. This was also when he felt his most harrowing and painful separation from God. The physical pain was the least of that temptation. It was all about his love for saving all of humanity, and doubt that he would be able to accomplish this. That doubt was part and parcel of his sense of separation from the Father—from the Divine that was his own soul. His greatest temptation was that he would not be able to save us from the clutches of the Devil, and from eternal pain and suffering. That is what he was fighting for. That is what he wanted with all his heart to accomplish. He was fighting to express his infinite divine love for us. And the temptation of doubt that now, in his final hour, he may not have done enough, may not be able to accomplish what he came here to do, was his greatest trial and torment. It was now or never. Still, he continued to live and act from the infinite divine love for all of humanity that was his own inner “I.” That is why he did not fail, but succeeded in his mission of saving us from the power of the Devil. That is also why he fully completed the work of glorification, of becoming fully one with the Father. It was in the very process of fully uniting with the Father that he conquered the Devil and broke the Devil’s power over us. In doing so, he saved us all from eternal damnation—if only we are willing to be saved. I should add that Jesus was never actually separated from the Father. He only, at times, had a sense of separation from the Father. He could not actually be separated from the Father any more than we can be separated from our own soul. The reality is that when he was in his times of greatest temptation, that was when the Father was closest to him, even though he wasn’t consciously aware of it. It is the same for us. When we are tangled in our deepest struggles of temptation, and are feeling a sense of despair, even though it feels as if God is completely absent, that is actually when God is closest to us. The finite human “I” that Jesus was engaged in during his times of “exinanition,” or emptying out, was real. He really felt those things. He really went through those deep, soul-rending struggles. He wasn’t just play-acting. He wasn’t just going through the motions according to some grand Shakespearean script that his Father handed him at birth. Jesus’ trials and temptations were very real. When he was going through them, he did not always feel assurance of victory. The very fact that he continued to act from love for all people even when his own fate and the fate of humanity seemed in great doubt is the reason he was always victorious. Just so, when we humans are at our lowest ebb, and think and feel that all is lost, if we still act with integrity and with love, rather than giving in to bitterness, fear, and hate, that is when we are truly victorious in temptation—or rather, the Lord and the angels are victorious in us. Even when Jesus was immersed in his lower, finite human “I,” he continued to act and live from the deeper “I” that was his true divine self. The lower “I” was real, it was not God, and it was temporary, but absolutely necessary as a means to face and defeat the power of evil, the Devil, and hell. That “I” is the Lord God Jesus Christ, the Divine Humanity, encompassing Father, Son, and Holy Spirit, who is the one and only God of the universe, our Savior and our Redeemer. ‹ Is it Right to Call Jesus “Father”?